Dermagran B are Hydrophilic Dressings that provide a moist wound environment for Wound Healing. Dermagran B Hydrophilic Dressings are Impregnated Gauze Dressings that are mildly acidic and contain a zinc-nutrient to help manage tissue trauma, surgical incisions, pressure ulcers, partial thickness thermal burns, diabetic ulcers and venous stasis ulcers. This impregnated gauze dressing includes a balanced pH and contains Vitamin A, Vitamin B6, Calcium and Magnesium. 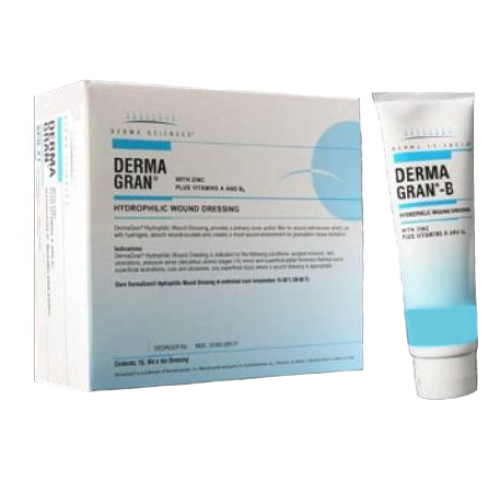 Manufactured by Derma Sciences, Dermagran B serves as a primary dressing or filler for chronic or acute wounds. 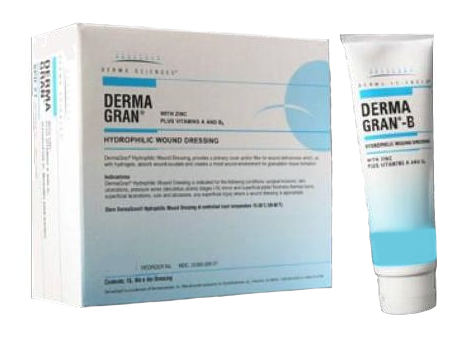 Derma Sciences Dermagran B Hydrophilic Dressings are available in square and rectangular shapes. Sizes of the Dermagran B Dressings include 2 x 2 Inch, 4 x 4 Inch and 4 x 8 Inch. Dermagran B Hydrophilic Dressings are sterile. Impregnated gauze dressing with zinc-nutrient for wound healing. Vitamin enriched dressing with Vitamin A, Vitamin B6, Calcium and Magnesium. Primary dressing for chronic or acute wounds. Derma Sciences Dermagran B Hydrophilic Dressings Product Number: SPD20, SPD24, SPD24. Size Options: 2 x 2 Inch, 4 x 4 Inch and 4 x 8 Inch. Dressing Shape Options: Square or Rectangular. Impregnated Ingredients: Zinc, Vitamin A, Vitamin B6, Calcium and Magnesium. Zinc Wound Dressings Encourage - Study presented at The Wound Heating Society, June , 1997. Age Related Differences in Topical Zinc - Clinical Topics on the Skin of the Aging and Aged1997 by Health Management Publications, Inc.
Dermagran B Hydrophilic Dressings provide an excellent moist wound enviroment as well as zinc to promote healing of difficult wounds.